More than 500 small businesses put their trust in Instaforce. Learn more about our team and what we are trying to achieve. Learn more about our clients, the results we’re generating and exactly what we are doing to help them reach their goals. You already know we do great work. The next step is to get in touch and see if we’re a good fit for each other. We’re looking for the right humans to help us do amazing work. If that’s you, awesome. Come join us on this journey. How an eCommerce store grew their Instagram with 1448 real, targeted followers in 2 months. It doesn't matter what kind of Instagram account you have - Instaforce can help you gain real and targeted followers. We have customers across the globe with different goals, niches, and interests. 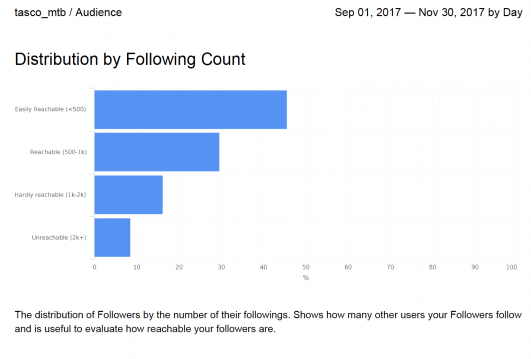 Read this case study to learn more about how we help them get more loyal, organic followers on Instagram. Building your brand on Instagram is tough work. Instaforce helps you identify the right audience and engages with them to get you more leads and help drive awareness, impressions and revenue home. Ecommerce, Mountain Biking & Cycling. The first step to growing your Instagram with Instaforce is by signing up. Instaforce offers a 30-day money back guarantee, where you get to experience growth by your account manager, without any risk at all. As soon as you sign up, answer a few questions about your account. More specifically, tell us what you’re interested in, and what type of followers you’re looking for. 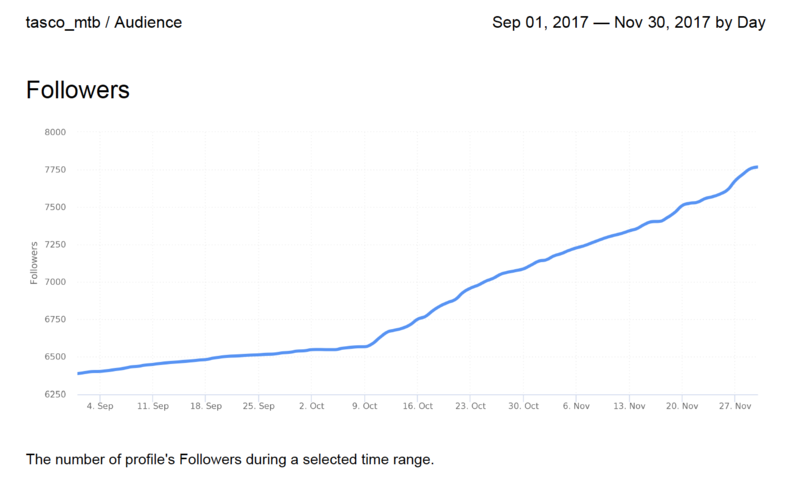 TASCOmtb Instagram Growth - We began our work Oct 9th. "We saw a huge growth of followers in a short time. Real followers, increased sales and overall great responsiveness from the Instaforce staff." 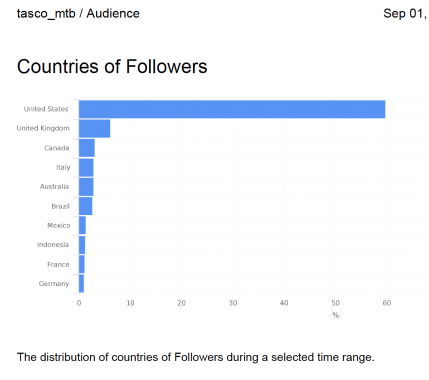 In the short period of October to November, TASCO had a growth of 1,448 new followers, which is 724 new followers per month, since they started working with us! That’s a 22% increase over a 2-month period! And it hasn’t slowed down since. We succeeded in boosting TASCO’s profile and making sure that the right target group took notice of their amazing products. As we continue to work together we will continue to generate consistent growth that helps them get a lot of relevant traffic to their Instagram, gain new targeted followers and customers which helps them on their way tobecome an authority in the niche and build social proof. Why did they start using Instaforce? TASCO MTB was founded by Nate Miller who has a deep love and connection with the great outdoors. TASCO was created out of the love for the mountain bike ride. Early on, Nate knew that Instagram would be one of the most influential marketing tools for his company. He realized he wasn’t taking full advantage of the channel and his target market. “I only used hashtags, cross-promotions, that sort of thing to gain followers organically. Cross promotion is great, but I felt I could only get so far.” So, he reached out to us to connect with more mountain bike lovers who wanted to ride the day away with superior products. Instagram is the first place people tend to look when they hear about a new brand. It establishes credibility with the customer and gives them a snapshot of what your brand is all about. While your account manager starts picking up your followers, Instaforce also identifies new sources for hashtags and usernames for your account to add over time. Optimizations usually mean that the longer you work with your account manager, the better your growth rate and followers will become over time. It’s important to remind you that your Instaforce account manager only engages with real users on Instagram. And engagement only comes in two forms – liking posts and following users. This way, your account manager doesn’t impact your brand voice, keeping your brand and persona consistent. Our clients see hundreds to thousands of new followers come in every month. Overall, the followers being picked up are real and incredibly targeted, which is the point of our service. We don’t promise to get you 100,000 followers (not within the first few months anyway!). Instead, what we do promise is to help you grow your engagement with organic, real, and targeted followers. Your followers should love what you post and your offers, and we want to help make sure that happens. Usernames: Competitors, complementary brands, niche influencers with strong followings within the US cycling and mountain biking community. Hashtags: Frequently used hashtags within the US cycling & mountain bike community. Once we locate the ideal sources matching the clients target audience, we start interacting with the most relevant users based on a certain set of criteria. We interact with hundreds of targeted Instagram users every single day to bring a consistent flow of awareness and traffic to our clients Instagram page, which as a results gets them increased engagement, followers, website visitors and sales. Try us for free without any strings attached. We'll show you the difference when growing your Instagram! Instaforce clients benefit from growing their Instagram with intelligent targeting. Empower your social influence and start building a loyal follower base that'll translate into sales. We're here to help give your social media marketing on Instagram a boost. Join hundreds of happy customers. With the power of Instagram and Instaforce, Nate has been able to see his products come full circle. Riders are now tagging photos of purchases, bringing his brand to life and reminding him why he decided to start this business in the first place. To top of it off, we send weekly growth reports that show the demographics of the new followers we have attracted, the reach and impressions of the profile and much more relevant data to track the results of our work and to further optimize his account. Try us for a month and see exactly what we can do for you! Ready To Grow Your Instagram?